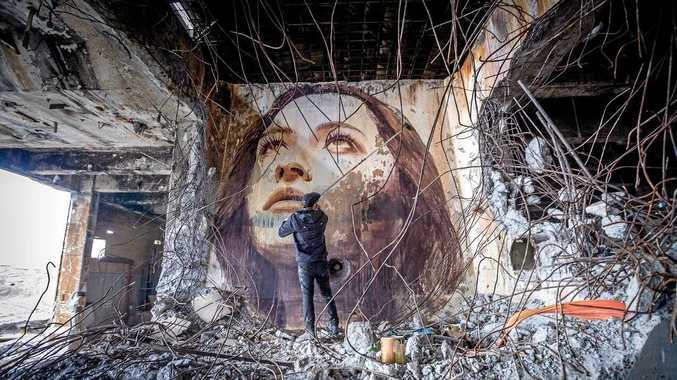 Rone takes you inside the famous street artist's world, following him into the rarely-explored spaces in which he works (an abandoned paper mill, a house set for demolition, a crumbling theatre), and learning about his unique philosophy on art, life and the artistic process behind his epic murals. IMAGINE being strapped to a hospital gurney in a murderous psychopath's warehouse, your only hope of survival resting in the hands of another escaped captive. Thriller-lovers will be able to experience this through virtual reality at this year's Gold Coast Film Festival (GCFF), who have formed a partnership with Byron Bay Film Festival (BBFF). Film buffs have the opportunity to enter the virtual realm and experience cinematic innovation first-hand, with the launch of a series of Virtual Reality (VR) films and experiences, including the Australian premiere of social VR experience Chorus, a world-class production straight from Sundance and SXSW. Created by virtual reality pioneers Tyler Hurd and Chris Milk, Chorus is orchestrated to the song Chorus by French electronic music duo Justice, and enables up to six people to be transformed into fantastical female warriors from different corners of the world to battle evil with dance lasers and crystals in an epic 1980s fantasy movie journey of empowerment. Byron Bay Film Festival has been showcasing virtual reality content since 2014 and Director J'aimee Skippon-Volke said she is proud to be partnering with Gold Coast Film Festival to bring virtual reality to yet another platform. "We are pleased to partner with Gold Coast Film Festival because we share a geographical base and in the scope of arts, location can stop the freedom to collaborate,” Ms Skippon-Volke said. "Gold Coast Film Festival and Byron Bay Film Festival share a passion and enthusiasm for enhancing our respective city's culture and introducing quality virtual reality works is part of that. The line-up also includes Gold Coast VR production, The Peeler directed by Harrison Norris and Guy Norris (co-directors of Suicide Squad VR experience), and produced by Bond University graduate Emily Tate. The Peeler is a VR thriller that takes viewers on a dark journey into a murderous psychopath's warehouse, filled with blood and gore. Festival-goers can enjoy five virtual reality experiences throughout the festival with Rone, A Thin Black Line and Inside Manus also making the program. The VR program will be held at the Gold Coast Film Festival's base of HOTA, Home of the Arts from Saturday April 28 - Sunday April 29. For more information about the festivals full selection of virtual reality, viewing times and booking details, visit www.gcfilmfestival.com.